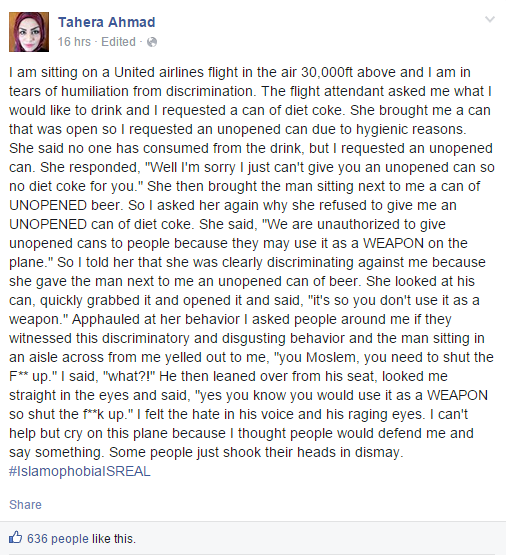 A Muslim woman was denied a unopened can of soda on her flight. She was denied it because the attendant thought she would use it as a ‘weapon’. However not long after this, the same attendant gave an unopened can of beer to a passenger. The attendant was clearly discriminating against her because of her being Muslim, wearing a Hijab. I am sitting on a United airlines flight in the air 30,000ft above and I am in tears of humiliation from discrimination. The flight attendant asked me what I would like to drink and I requested a can of diet coke.